1. CVL was recently selected as the ACEC 2018 Engineering Excellence Grand Award winner for the Thunderbird Road 16-Inch Water Main Replacement. 2. 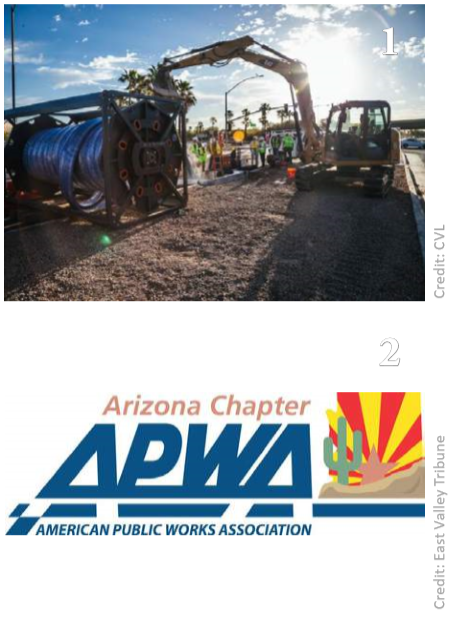 The Arizona Chapter of the American Public Works Association has recognized the $11M Alma School Road/Chandler Boulevard Intersection Improvement Project, a major intersection improvement project in Chandler as “Project of the Year”. 3. Rio Nuevo recently posted updates on the projects under its care. Caterpillar Tucson’s Mining Center: Construction is on time and on budget and expects tenancy to take place in March 2019. Sunshine Mile: 17responses received from local architects interested in renovating the 40 properties between Euclid Avenue and Country Club Road. TCC Hotel: Caliber has announced the new hotel will be a Hilton and will present plans to the Rio Nuevo Board during its October meeting. 75 East Broadway: JE Dunn has until the Oct. 23 Rio Nuevo meeting to finalize plans for the proposed 20-story tower designed to be located across the street from TEP. Cathedral Square: Construction continues on the $24M Cathedral Square project, and improvements on Ochoa Street will commence within the next few months. The Marist: quickly nearing completion and will provide housing and recreation space for seniors in the downtown core. City Park: Hexagon Mining took occupancy of 100 percent of the available office space in August. A food court, bowling alley and rooftop bar will be open by January 2019. Monier Mixed Use: Rio Nuevo Board approved a $2.4M secured bridge loan to finalize the $35M Gadsden project. 4. Greenberg Construction recently finished two major projects: The Grand Canyon Aircraft Rescue and Firefighting Station for the Hualapai Tribe in Peach Springs, and the Chinle 19-unit staff quarters project for Indian Health Service. 5. Luxury condo development The Edison Midtown officially opened with a celebration Oct. 4, on the SEC of Central Ave. and E. Monterey Way in Phoenix. 6. Artspace Mesa Lofts – a 50-unit multifamily development consisting of live/work space for artists and their families – is now open. The project includes 1,450SF of commercial space for nonprofit arts-focused organizations and creative businesses, and 2,900SF for events and exhibitions. 7. Medical software company WebPT renovated its 30KSF headquarters in the Phoenix Warehouse District and also expanded and moved into an adjacent 7KSF space formerly home to Mi Hacienda Tortilla Factory at Fifth and Grant streets. The renovations began in April 2017 and ended last week. 8. Pima County’s Mike Jacob Sportspark has re-opened following a nine-month closure. The park closed on Dec. 31, 2017 for its first major reconstruction improvements in 25 years. 9. The $6.7M Yuma Union High School District No. 70 offices opened in August.